Coconut rice is one of the most flavorful rice recipes you’ll ever taste! 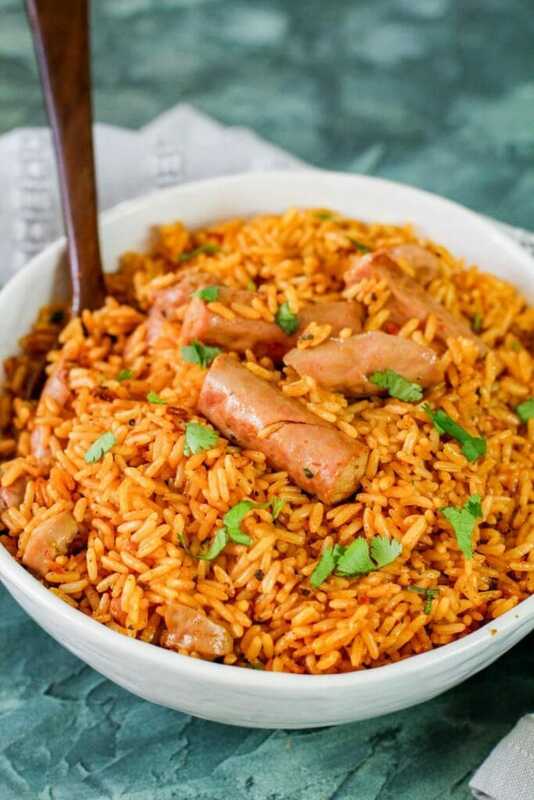 Add in some gandules for a perfect arroz con gandules recipe, or take your Spanish rice up a notch by adding in vienna sausages to create this one of a kind Spanish coconut rice recipe. What is Spanish coconut rice? 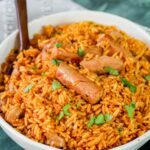 Spanish coconut rice is cooked in coconut cream with homemade sofrito, vienna sausages, and a few spices for an easy coconut rice recipe. The flavor profile of Spanish coconut rice is like arroz con pollo, but it has a subtle sweet taste. 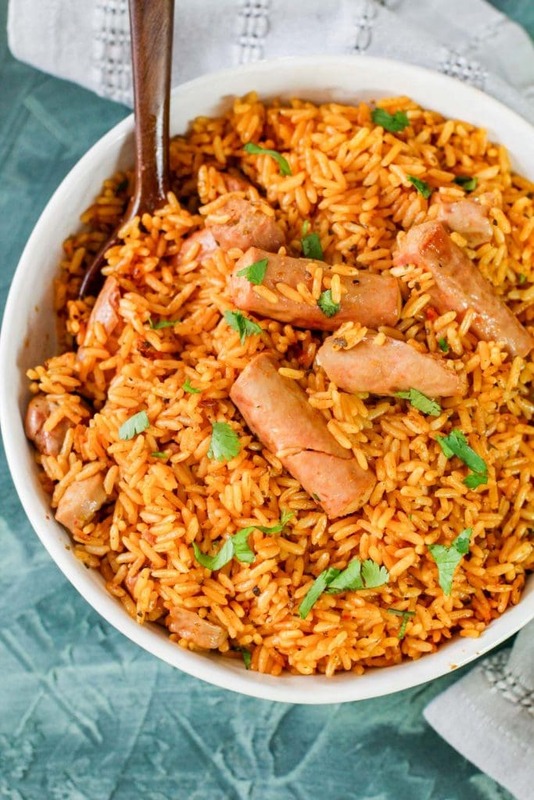 For this easy Spanish coconut rice I decided to add whole vienna sausages which makes this coconut rice recipe the perfect weeknight rice recipe to make when you’re in a rush. In Spanish, we call this recipe arroz con salchichas y coco. The homemade sofrito really makes this dish, but if you don’t have sofrito on hand, you can make a simple base out of chopped onions, garlic, bell peppers, and cilantro to take it’s place. 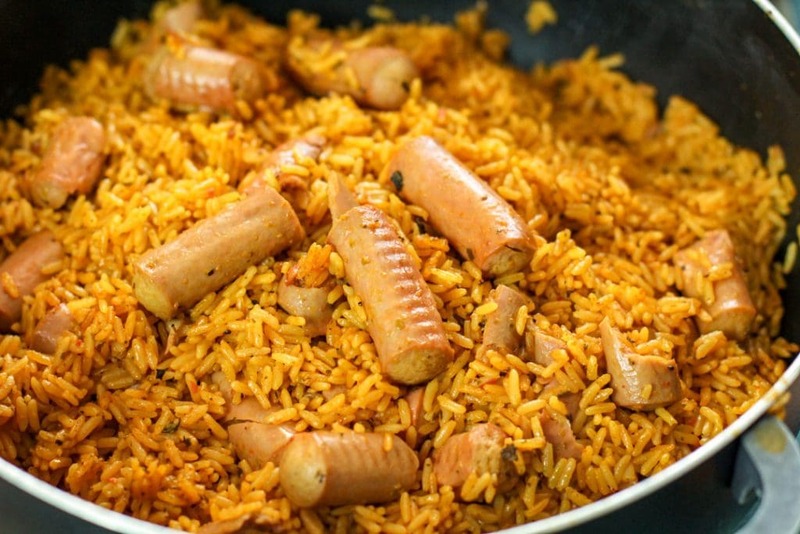 This one pot coconut rice dish is seriously made in no time using parboiled rice. Warm oil, add in sofrito, spices, chicken bullion, coconut cream (or milk), vienna sausages, cook for a few minutes before adding in your rice. I like to allow the rice to infuse with the coconut milk mix before adding in the fresh cilantro and water (or broth). Next, higher the heat really quick to bring the coconut rice mix to a boil, lower the heat to medium low and cover. Let it cook for 20ish minutes before checking on it. At this point, I like to GENTLY fluff the coconut rice, cover the pot again, turn off the heat and let it sit for ten minutes before serving. What should I serve with spanish coconut rice? When I make Spanish coconut rice, I love to make potato salad with apples on the side and either pernil or bistec encebollado if I have the time. But if I’m in a rush, I just make this coconut rice and serve a veggie with sliced avocado on the side. This recipe calls for 3 cups of rice, so there most likely will be leftovers. You can add a little oil to a pan to make refried Spanish coconut rice, top it with an egg for a yummy breakfast, or add some refried beans and ground beef to create burritos. This Spanish coconut rice recipe is versatile to make a new dish as a leftover. 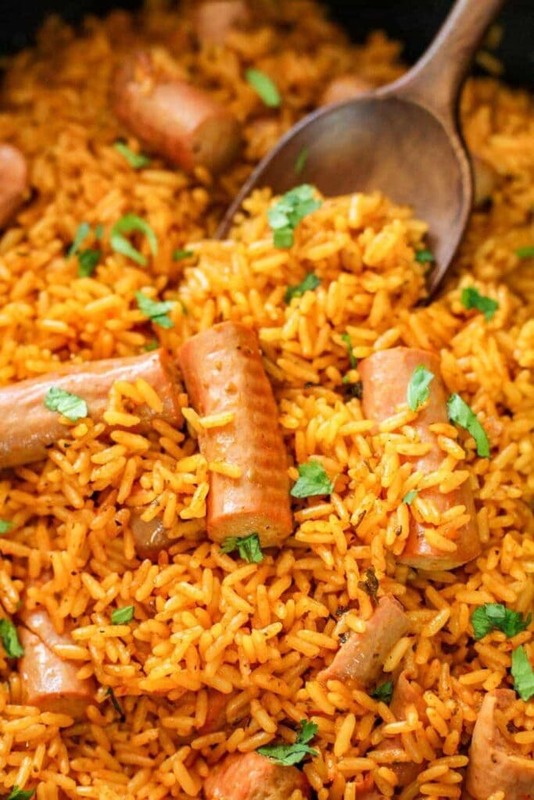 Savory Spanish coconut rice with vienna sausages is the perfect one pot weeknight dinner recipe! Heat oil over medium high heat in a large caldero or a heavy bottom pot. Add in sofrito, tomato paste, seasonings, and the bay leaf. Cook for 2-3 minutes before adding in the remaining ingredients. Higher heat to bring rice mixture to a boil and after 2 minutes, lower heat to medium low heat. Give a quick stir and cover with a tight fitting lid and let cook for 20-25 minutes before lifting lid and giving the rice a gentle stir. Turn off heat, let rice sit for ten minutes before fluffing and serving.